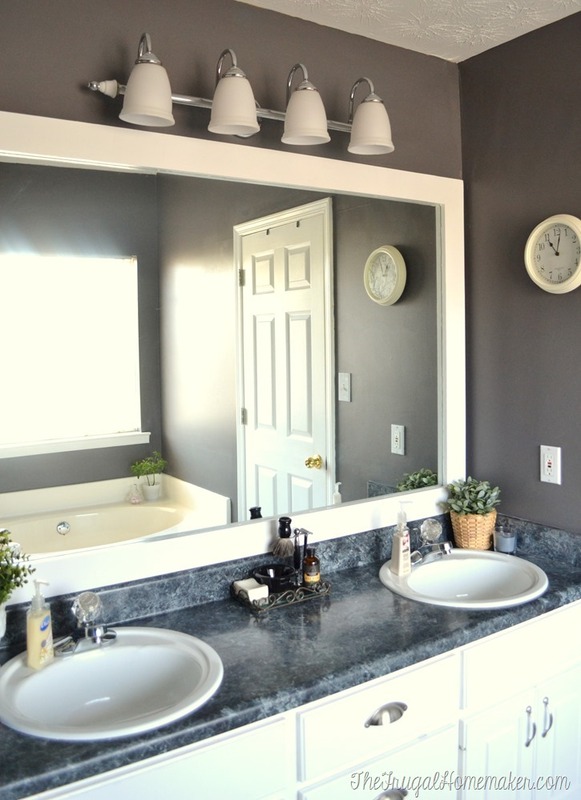 Then I painted the entire bathroom in Magnet by Behr Marquee (same color as our master bedroom), changed out the light fixture with a freebie from my brother, removed all the beige décor, and put up a new shower curtain. I also added some subtle tone on tone stripes in different paint sheens that I just love on that one wall. But I wasn’t done yet. I had 3 more projects I wanted to complete and hopefully by tomorrow all 3 will be DONE! First up was framing out the builder basic mirror. So here’s what it looks like now. Another pretty big difference for a small budget! 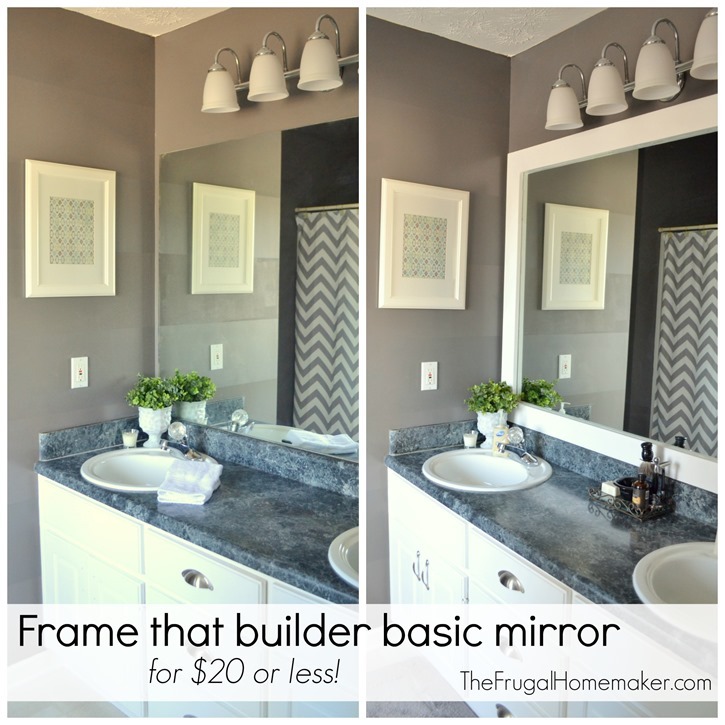 I discussed in this post the different styles and ways you can go about framing in your builder basic mirror for cheap. 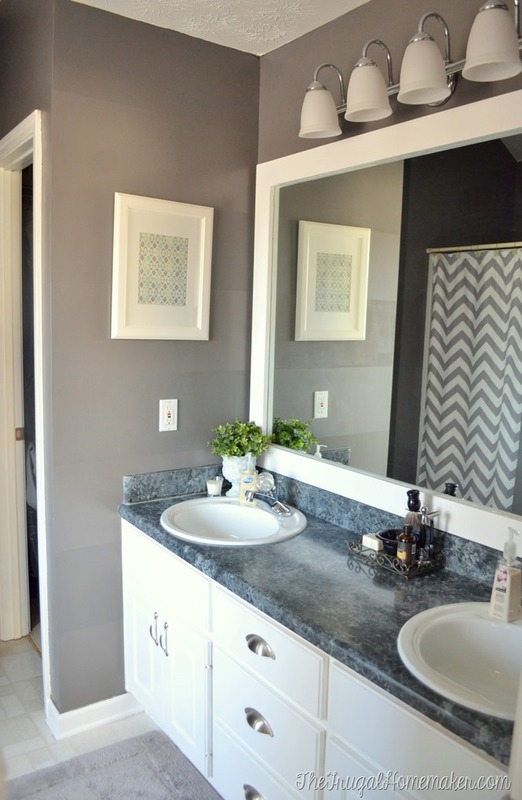 I had originally thought I was going to go with a more detailed trim to frame out the mirror but after I checked cost on the trim I wanted to use (my mirror was BIG!) and reconsidering, I decided to go with a more basic/clean look. 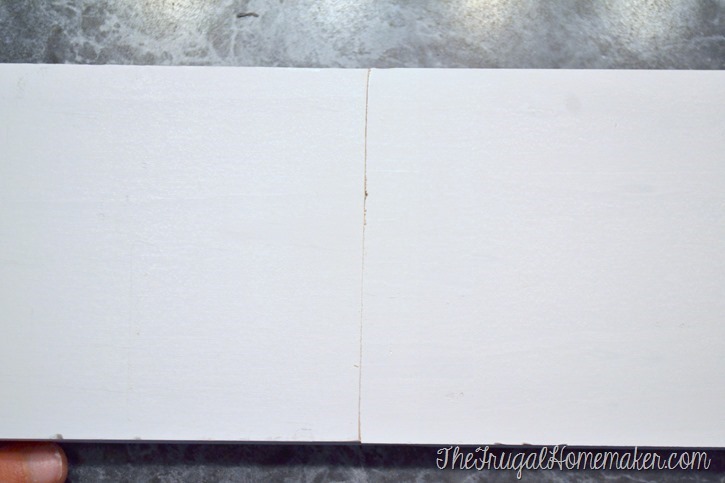 I browsed the wood and trim aisles of Home Depot and picked out a primed 1×4 inch trim board. I could have gone with a basic pine board which are super cheap BUT if you do that you have knots and grain and things to work around. 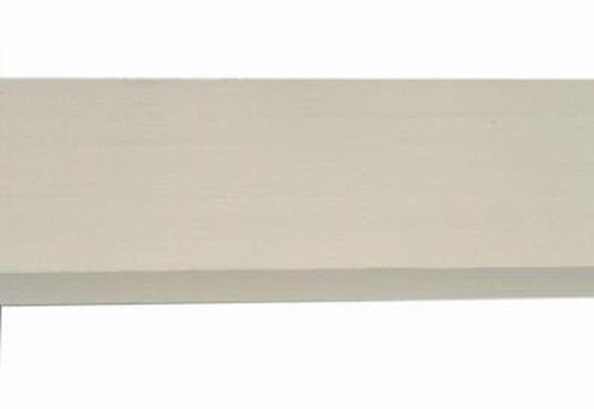 With this primed trim board – there are no knots, no grain, no holes – it is completely smooth plus it was already primed! I had to buy 3 boards at $7 a piece so this project came in at just over $20. I didn’t have clips on my mirror but did have a countertop on the bottom to work around – I decided to make my boards overlap on top of the mirrror a good bit. 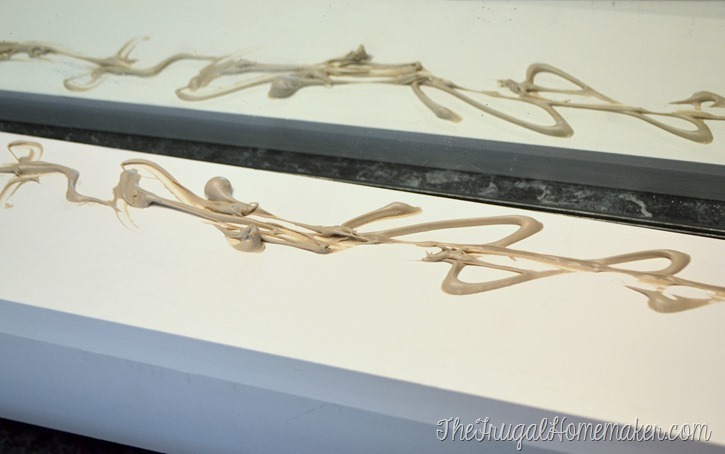 To adhere the wood to the mirror, I used a liquid nail product that is specifically designed for mirrors. I mitered the corners with my miter saw, but you could get Home Depot to cut your boards to size and just do a straight cut in corners if you don’t have a miter saw. I did make a mistake and cut my mitered corner at the wrong angle on one of the boards. I thought I was going to have to go buy another $7 board, but I was able to do an angled cut and seam the 2 pieces of board together to get the length I need and you can’t even tell! 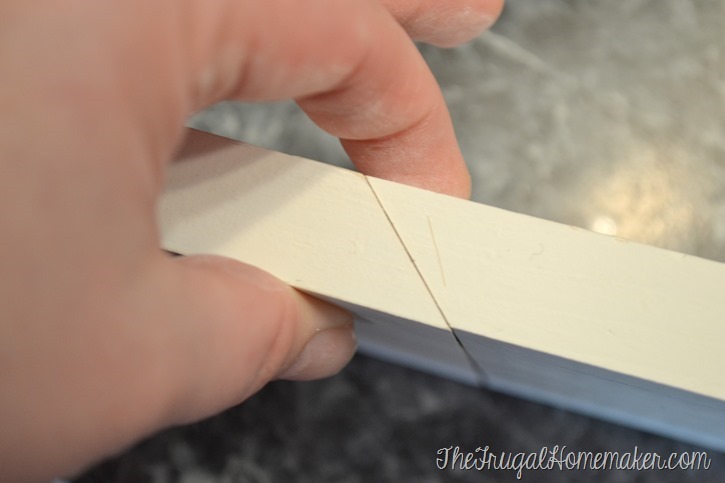 You would do this same process of a seam (versus just cutting a straight cut and butting them together) if you were installing baseboard or a chair rail and your piece wasn’t long enough and you needed to add a second piece. Once you caulk, sand, and paint you can’t even tell. 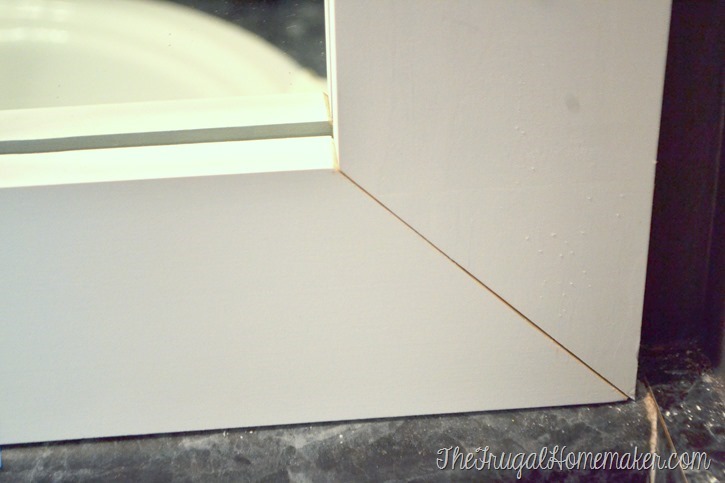 Apply your liquid nails or glue to the back of the board but make sure to leave an inch or so at the top of the board so you won’t see the glue reflected in the mirror. I used tape to hold it in place while it dried. Here’s one of the corners – don’t be afraid if they don’t match up perfectly. Nothing that a bit of caulk can’t fix. 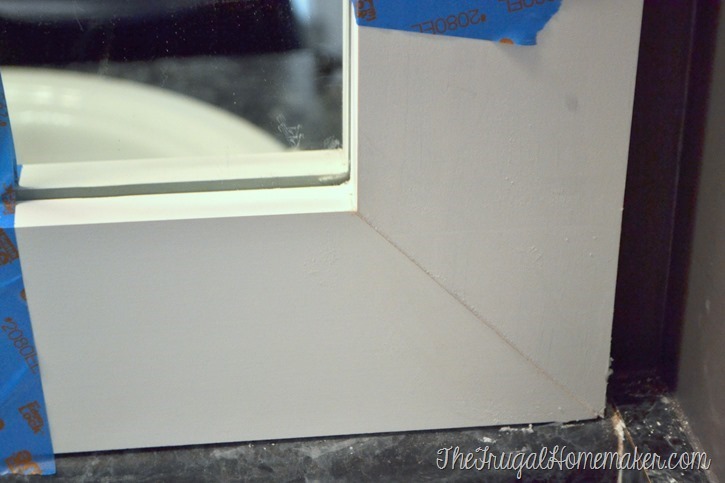 Here’s how it looked after caulking – just needed to sand lightly and paint. And here’s the finished product! I absolutely love it! 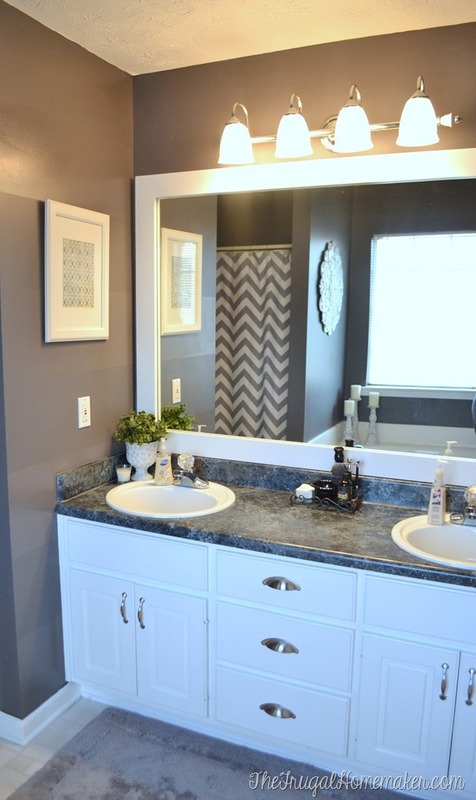 It give the bathroom an even more updated look. And I just love the contrast between the white and dark walls. Here’s a picture with the updated light fixture on. Now to install some shelves over the tub and install a curtain. I actually started on shelves as soon as I was finished taking these pictures so this bathroom should be finished by the end of the week! 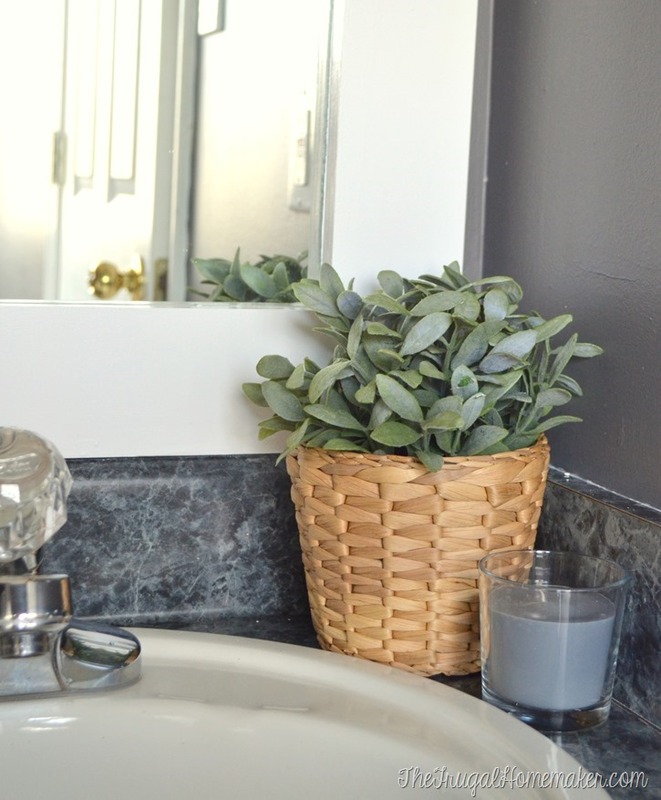 I framed my guest bathroom mirror too – you can see that post here. 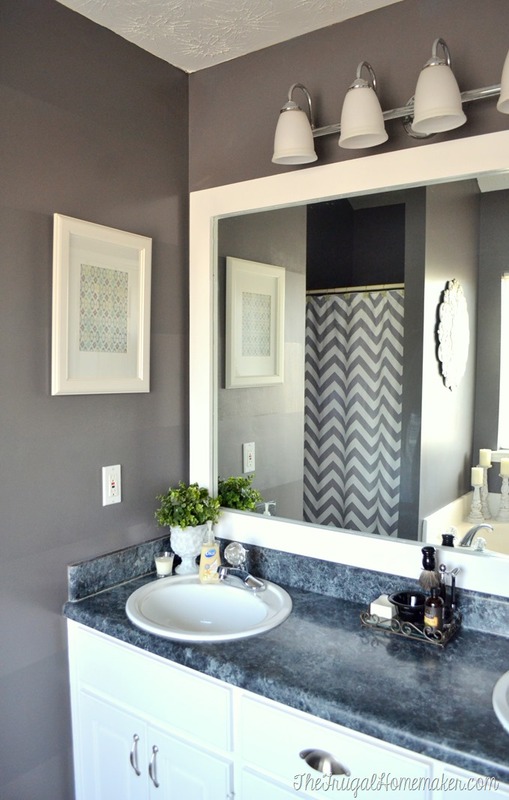 Have you framed out your bathroom mirrors? It can make a huge difference! Wow, Christina!!! That looks amazing! Seriously impressed at what a difference the framed mirror makes! 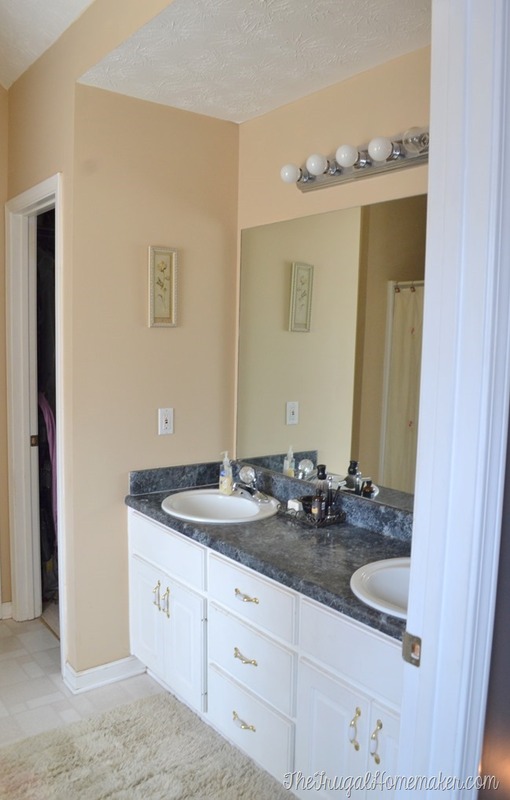 Great job – I can’t wait to see the completely finished room, but it looks so good now too! This looks great. I’m moving into a new home so I have few projects, but this will be one of my first. I have no project history under my belt do I’m scared but it looks doable. Wow!! Framing the mirror made a huge difference….and so pretty! 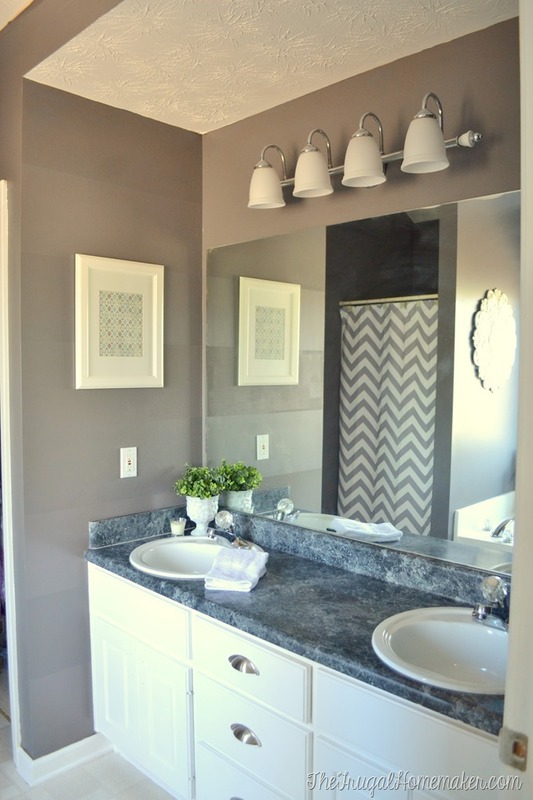 I love how the white looks next to the gray walls, and also the gray counter tops. 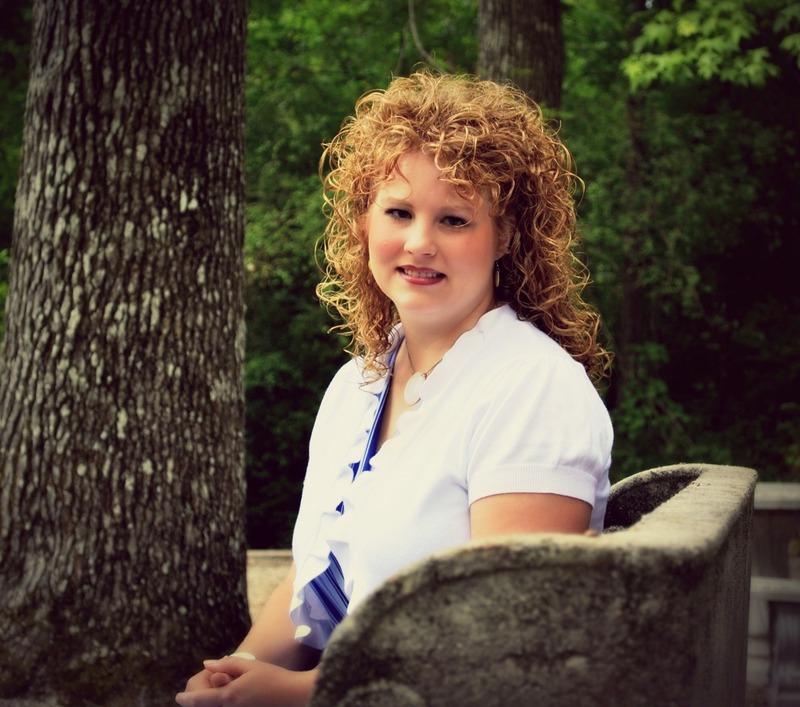 Can’t wait to see the rest of the makeover! Looks lovely. I was going to do the very same thing at my old house but now we moved & no longer own. We are living in an apartment for now. If my mirrors are bare in our future home I will be doing this. Thank you Christina! Great work! I framed one of our bathroom mirrors and wanted a different approach for the next bathroom. You provided some ideas I hadn’t thought of. Thank you! So you painted the boards after they were up? Maybe I missed something . . . . or you had to touch up after installing? Looks great Christina. I like it!! I’m glad to see you do this! I have been wanting to do this for quite some time but hadn’t gotten up the guts to do it yet! Now just to get those corners cut! Looks great! Planning to do my bathroom mirrors. Hi. My mirror does have the little clips. Any ideas about that? you would handle the clips? Yup, it’s the clips that have been holding me back. This looks really nice! 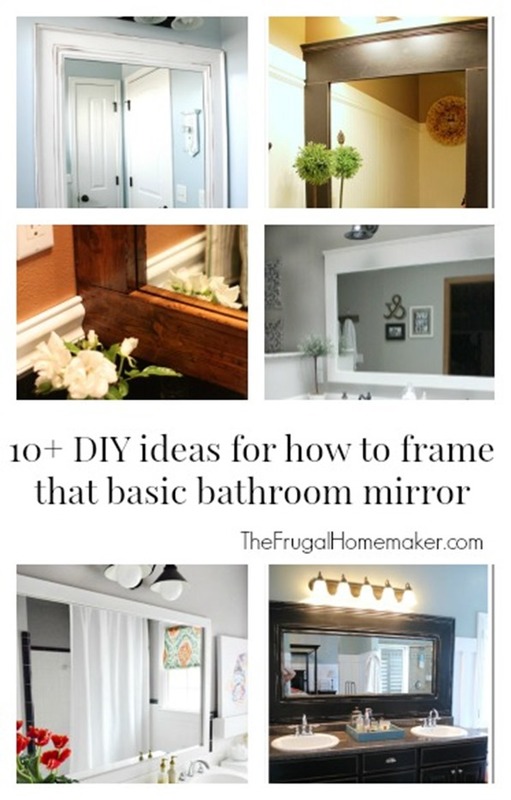 However, my large bathroom mirrors do have 4 clips so I would have to use a router to remove some of the wood so it would sit flush with the mirror. Thanks so much for the easy and precise instructions. 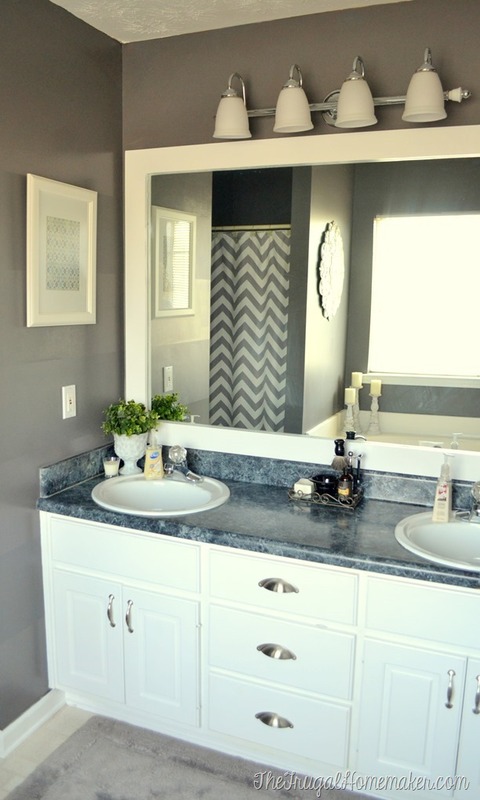 Your finish bathroom looks so beautiful ????!! What do you do with the clips? 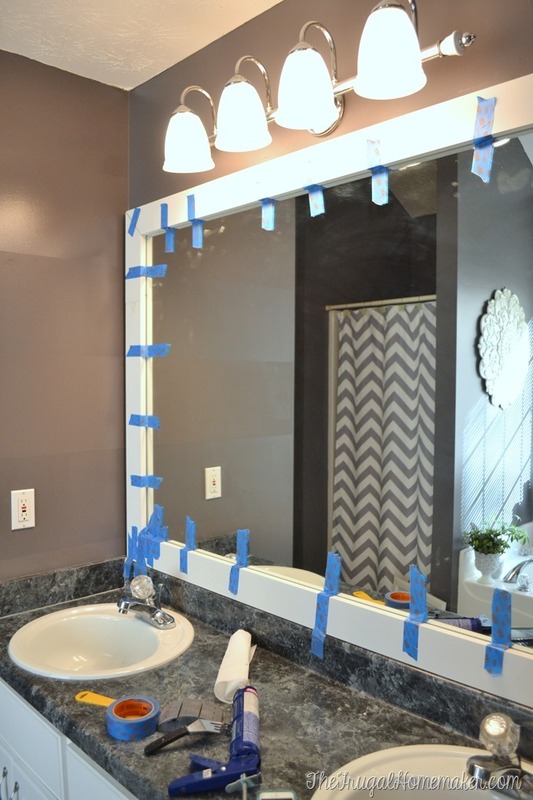 Pretty sure the mirror is glued on the wall.just remove the clips and your new frame will take the place of the clips! The new frame will hold the mirror in place! The frame is glued to the mirror. I don’t think it will provide any support. Looks great! Any chance you know what color paint you used for your walls! ?